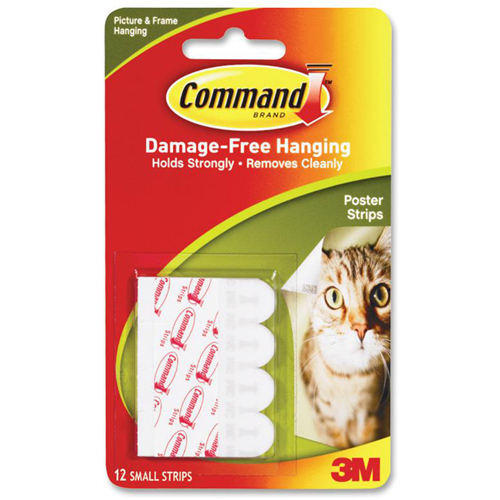 Command™ Adhesive strips from 3M offer no-hassle, no-damage solutions for displaying, mounting and organising. A range of adhesive hooks, picture hangers and organisers with firm holding power they will not lift or mark the wall in any way when removed. 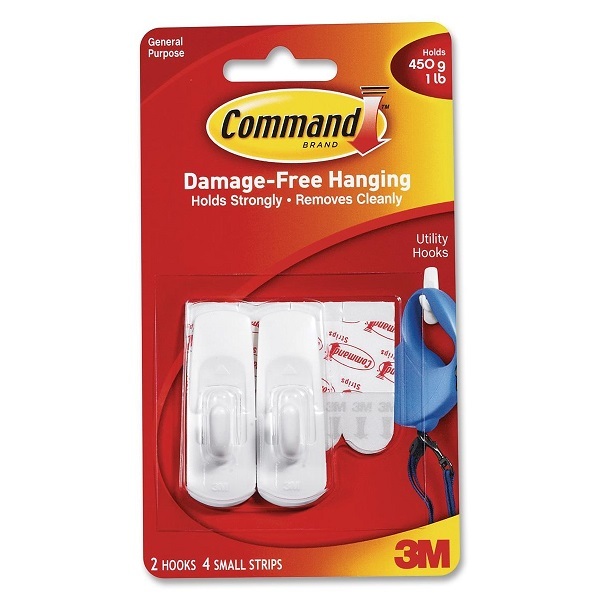 Command™ medium hooks allow you to hang a range of items, damage free, without a single nail hole. With firm holding power they will not lift or mark the wall in any way when removed. Easy to apply reusable hooks and clips. Pack contains 2 medium hooks and 4 strips. 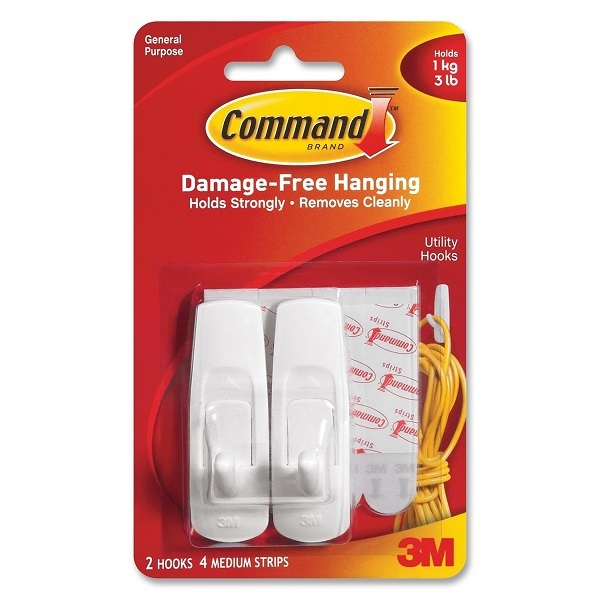 Command™ small hooks allow you to hang a range of items, damage free, without a single nail hole. Pack contains 2 small hooks and 4 strips. 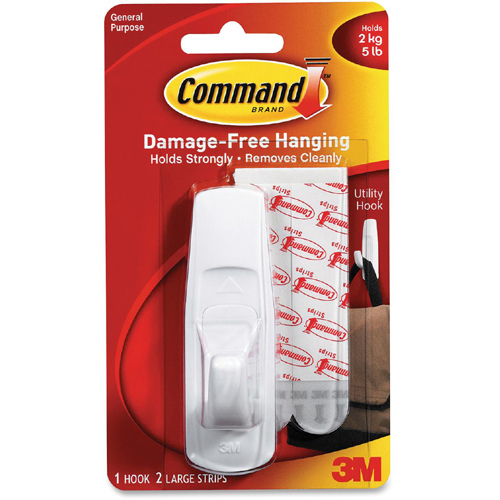 Command™ large hooks allow you to hang a range of items, damage free, without a single nail hole. Pack contains 1 large hook and 2 strips. Command™ poster strips securely hold posters, calendars and other lightweight objects firmly to a wall without sagging or falling down. Poster strips work on a variety of surfaces and are easy to apply, easy to remove; simply stretch to remove. Reusable strips remove or adjust without damaging walls or surfaces. Pack contains 12 small poster strips. 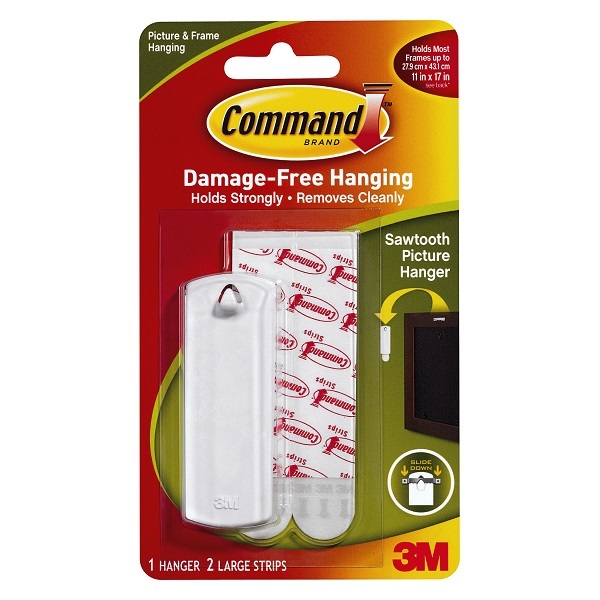 Command™ sawtooth picture hangers makes picture and frame hanging a breeze. Hang or take down pictures as often as you want; easy to apply and to remove; Leaves no nail holes. Works on a variety of surfaces. Pack contains 1 large hanger and 2 strips. 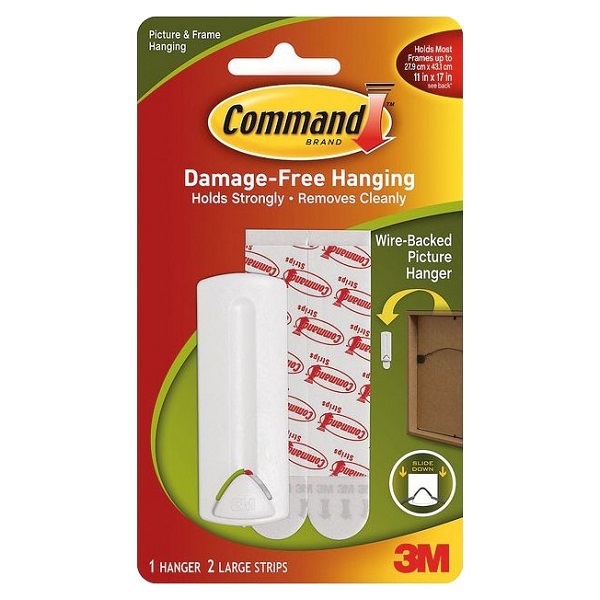 The Command™ wire-backed hanger is designed for hanging picture frames with a wire. 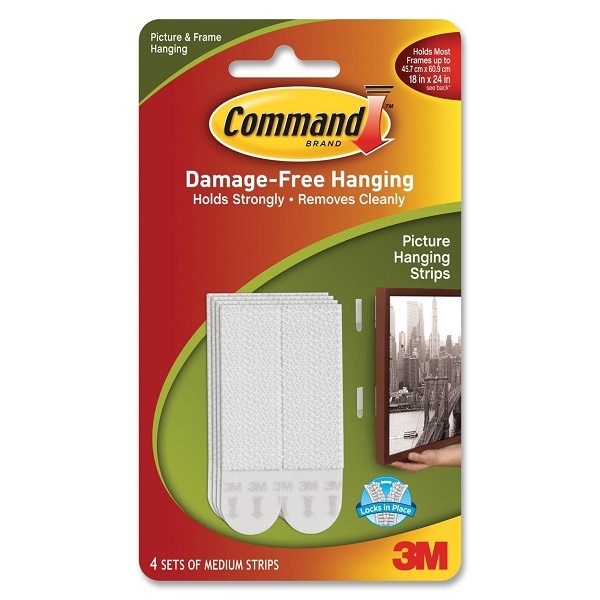 Medium picture hanging strips with Command™ Adhesive lock in and hold firmly where placed. Fasteners can be separated and reattached with the rubber resin adhesive. Pack contains 4 sets of medium strips. 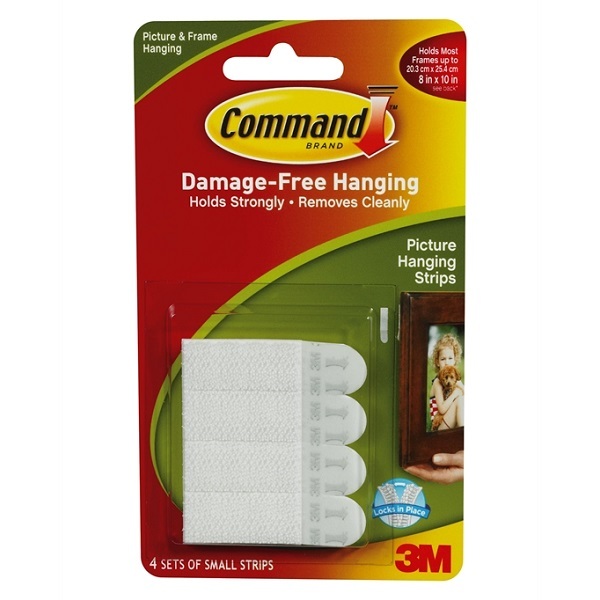 Small picture hanging strips with Command™ Adhesive lock in and hold firmly where placed. Pack contains 4 sets of small strips.